The new CW3E at Scripps Institution of Oceanography (SIO) hosted a strategic planning meeting with the SCWA to identify common interests between SCWA’s needs for targeted science, technology and applications development and the CW3E mission. The meeting focused on current SCWA issues such as reservoir operations and a discussion of planned and ongoing projects such as the NOAA Regional Integrated Sciences and Assessment (RISA) program at SIO (the California-Nevada Climate Applications Program CNAP) and the HydroMeteorology Testbed (HMT). Strategic directions and specific next steps were addressed at the meeting. 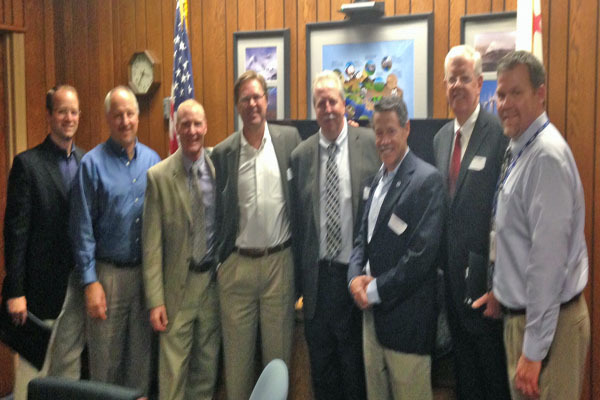 The photo above shows several of the meeting attendees (from left to right): Brad Sherwood (SCWA), Jay Jasperse (SCWA), Rob Cifelli (NOAA), Grant Davis (SCWA), Marty Ralph (Scripps), Dave Reynolds (CIRES) and Carl Morrison (SCWA).